Our three door display freezer may be small, but we squeeze in a healthy selection of quick dinners, Ezekial bread, and frozen treats of all kinds. 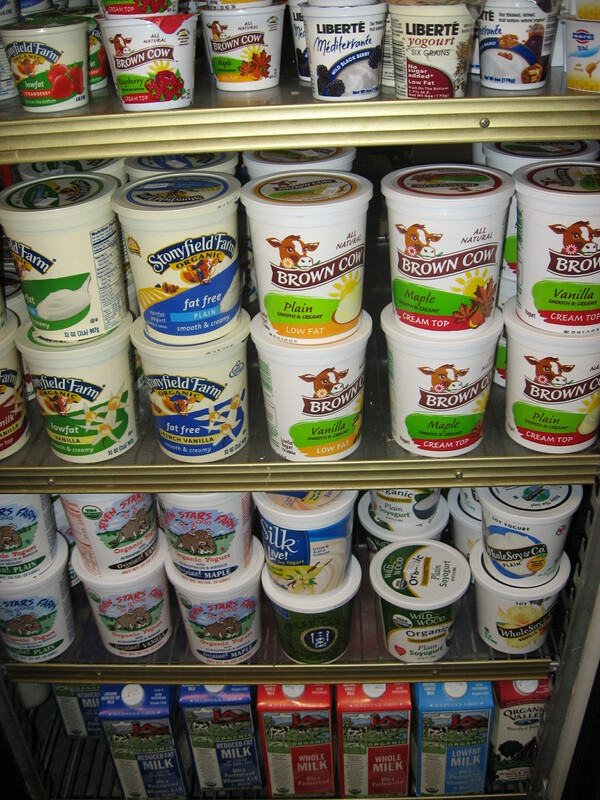 We have Icecreams made from Cows Milk, Soy Milk, Rice Milk, and Coconut Milk. Check out our Island Style Icecream,with both vegan and dairy flavors, made just one block from Glut! Another favorite is the Terry’s Healthy Foods mock-meats. Our fastest selling frozen product by far is Terry’s Citrus Spare Ribs, but almost equally as popular are the fake salmon, white fish, and “fish-ham.” While the idea of “Fake Shrimp” may sound bazaar, don’t skoff until you try it, even for the carnivores among us it’s a mighty fine dinner. We carry a wide section of dairy and non-dairy milks and yogurts, as well as many types of mock sand which meats, taco meats, and sausages. Below is a list of some of the brands we carry!